BvS producer Charles Roven accidentally revealed the origin of the new DC cinematic universe's Wonder Woman. It really shouldn't come as a surprise to anyone, but just in case some folks consider it a spoiler for Batman V. Superman: Dawn of Justice, I'll put it after the jump. 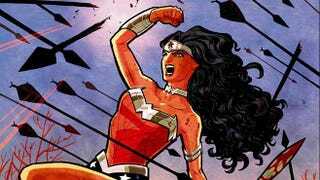 The movie Wonder Woman will very unsurprisingly ditch her original origin, in which she was made of clay by Hippolyta, queen of the Amazons, and use her New 52 origin, in which she's a demigod born of Hippolyta and Zeus. I know some people are upset about the change, but I always figured that being a demigod better explained her odd assortment of powers better than her strange clay origin. It's definitely a bit easier for people to wrap their heads around. Perhaps most importantly, now that Marvel has done the heavy-lifting with Thor, audiences are presumably primed to accept Greek mythology as part of the DC universe, which I'm betting DC is happy to lay claim to before Marvel uses it. But I wouldn't begrudge anyone who loved the fact that literally no man was responsible for Wonder Woman's awesomeness and is lamenting the change. Still, something tells me that this is not going to end up in the Top 3 most upsetting changes the movie will make to the character. Just a hunch.